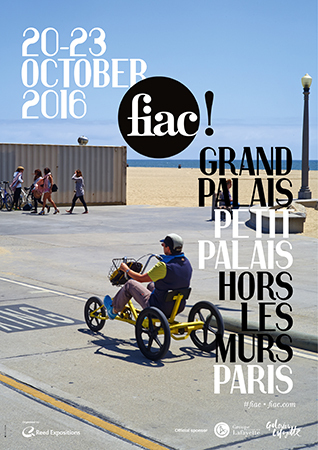 The 43rd FIAC will be held in Paris from October 20 to 23 in the Grand Palais. The vernissage will take place on October 19. The fair will present some 175 galleries from 26 countries. The General Sector will feature 165 galleries deployed in three spaces: the Nave on the ground floor together with the Salon d’honneur and the Upper Galleries on the first floor. The Upper Galleries also host the ten galleries comprising the Lafayette Sector. The Lafayette Sector, a programme launched in 2009 by FIAC and the Groupe Galeries Lafayette, Official Sponsor, underlines their joint desire to provide support to the actors of the emerging art scene in its international dimension. The Lafayette Sector provides financial support to ten French and international galleries presenting emerging artists. The 2016 jury was formed by Guillaume Houzé (Director of Patronage of the Groupe Galeries Lafayette), Daria de Beauvais (Curator, Palais de Tokyo, Paris), Florence Bonnefous (Air de Paris, Paris), François Quintin (Executive Manager, Fondation d’entreprise Galeries Lafayette, Paris) and María Inés Rodríguez (Director, CAPC / musée d’art contemporain, Bordeaux, France). The new sector of FIAC, On Site, will present sculptures and installations in the prestigious context of the Petit Palais, directly opposite the Grand Palais in collaboration with Christophe Leribault, curator and director of the Petit Palais, and associate curator Lorenzo Benedetti. On Site will present around 20 artworks, exhibited in the Galerie Sud, the Pavillon Sud, the suspended garden of the Petit Palais and in the surrounding colonnade, as well as on the esplanade in front of the museum. This sector will enable FIAC galleries to exhibit important works in museum conditions, in close proximity to their stands at the Grand Palais. FIAC 2016 restates the defining principles of its identity: the undisputed quality of its exhibitors and the works on view, the unrivalled beauty and prestige of its venues located in the heart of Paris and its signature Hors les Murs programs. In association with the Domaine National du Louvre et des Tuileries, an ensemble of outdoor works will be presented in the Tuileries Garden. In collaboration with the Comité Vendôme, monumental outdoor sculptures will be presented on the prestigious Place Vendôme. Artist’s films will be presented in association with the Fondation d’entreprise Ricard in the Cinéphemère installed in the Tuileries Gardens. FIAC develops its program of artists’ performances, introducing a new festival in collaboration with the Louvre Museum, the Palais de la Découverte and the Grand Palais. Around 20 performances will take place in different venues throughout the fair. A conversation room will host talks inside the Grand Palais on themes such as the relationship between the visual arts and scientific research or architecture. “Carte Blanche” invitations will be extended to artists for evening programs at the Silencio nightclub designed by David Lynch. Film projections, concerts, performances, book signings and/or artists’ talks are programmed. The “In Paris during FIAC” program presents a network of over 100 cultural institutions, including prominent museums, arts centers, private foundations and collections such as the Louvre Museum, the Centre Pompidou, the Palais de Tokyo, the Musée Picasso, the Fondation Louis Vuitton, the Grand Palais, the Musée d’Art moderne de la Ville de Paris, the Château de Versailles, the Arts Décoratifs, and the Petit Palais. “Musées en Seine” proposes innovative river access to an ensemble of Paris’ major institutions providing a fresh new alternative for discovering cultural Paris.